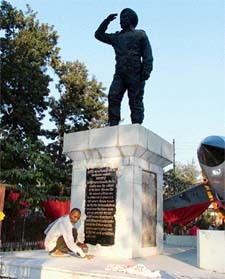 The plaque that had gone missing from the statue of Param Vir Chakra winner Flt Lt Nirmaljit Singh Sekhon recently was replaced on the eve of Vijay Divas here today. The state unit of the Communist Party of India (Marxist) today rejected the recommendations of the Johl Committee, set up by the Punjab Government to explore ways for agriculture reforms in the state. The CPM said in case the recommendations of the Johl Committee were implemented, it would lead to a recurring loss of Rs 1,400 crore to farmers every year, besides others. Imagine whose command DMCH employees obey! Even the tragic railway accident at Mukerian did not move the striking employees of the Dayanand Medical College and Hospital (DMCH) to join their duties. Despite repeated requests by the management, doctors and even their own leaders, they were not prepared to work thinking it to be the best occasion to strike a bargain. But a warning phone call from a police official did not leave the striking workers with any other option but to join their duties. The district administration today challaned 23 vehicles as these were being run on LPG. Following directions of Deputy Commissioner Anurag Verma, a special drive was launched to check illegally plying of vehicles using LPG ment for domestic use. Today, early in the morning a school bus of the local Nankana Sahib Public School carrying about 40 schoolchildren overturned near Gehlewal village, 5 km from here, resulting in 23 children receiving injuries, some simple and some grievous. One seriously injured student was referred to a hospital in Ludhiana. The lure of a male child after four daughters led a local resident into the trap of two tantriks who duped him of Rs 23,000 in the name of ‘ensuring’ the birth of a son. The victim, Sucha Singh, has lodged a complaint against tantriks Baby Delhi Wala and Abdul Mazid Kadri of Malerkotla in the Division No 7 police station, charging them with fraud and cheating. He said he gave them his hard-earned money to have a son, but was again blessed with a daughter. The daring attempt by a physically challenged social activist to hold an alleged drug peddler, who tried to supply psychotropic substance to an addict in a private hospital in Ludhiana, has pushed drug traffickers on the run. 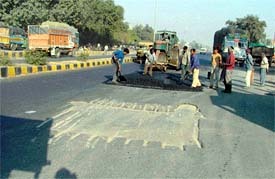 Less than two months after the Ludhiana Municipal Corporation recarpeted a stretch of the Ferozepore road, from the local milk plant to octroi post, it has withered away with patches appearing on it. The repair work is on to cover up these patches. Activists of the Lal Bahadur Shashtri Social Forum today observed a two-minute silence and expressed grief over the loss of human lives in the train accident near Mukerian yesterday. A case of mistaken identity of an injured youth in the Mukerian train accident had sent the family of an electrician in Harbans Pura in a tizzy, with anxious relatives and friends rushing to the accident site, besides visiting various hospitals in Jalandhar and elsewhere in search of missing persons. Activists of the Revenue Patwar Union, Ludhiana, donated Rs 51,000 for the victims of the Mukerian railway tragedy here today, besides observing silence for the departed souls. Protesting against the privatisation of the Punjab State Electricity Board (PSEB) and demanding nullification of the Electricity Act, 2003, around one lakh employees of the board will go on one day strike from midnight today. The mela of Baba Peer Bauri Shah will be celebrated with great enthusiasm and fervour on the national highway near the police station at Sahnewal tomorrow. Thousands of devotees visit the samad of the Peer Baba and get their wishes fulfilled. On every Thursday, the devotees come in large numbers to pay obeisance. 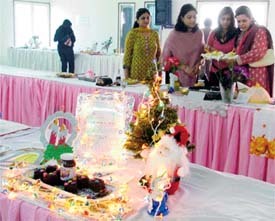 A cookery contest was organised by Cremica at the Luxmi Ladies Club here today. The contestants prepared salads, sandwiches, desserts using company’s products. Gift hampers were given to the best entries. Members of the club also enjoyed tombola. A Christmas ward caroling service was held in the hospital chapel of Christian Medical College and Hospital (CMCH) here. The event was organised by the Fellowship Department under the leadership of Rev John Mall, Chaplin and administrative head of the department. While the second accused wanted by the Dehlon police in a case of abduction of a minor girl of Jand village has been arrested the panchayat of the village of the youth has approached senior Congress leaders to impress upon the police to review the case and get the investigation done by an officer not below the rank of the DSP. A money exchanger was robbed of Rs 4.81 lakh in Raikot late in the evening today by unidentified robbers, who hit him on the head with an iron rod and ran away with the bag containing the money. Vinod of Mahavir Colony, along with Raju and Binder, allegedly assaulted Mandip Singh Buttar, a Canadian citizen, with sharp-edged weapons. They were also allegedly having a .12 bore gun. A thief stole an LPG cylinder from the house of Additional Sessions Judge Vijay Singh yesterday by befooling one of his servants. The thief claimed that he had come from a gas agency to replace an empty cylinder. Industry representatives have pointed out flaws in Punjab's VAT Act stating that “it seems to be the worst of all as it is overwhelmingly a statute of penalties”. Expressing apprehensions about the misuse of authority, the Apex Chamber of Commerce and Industry said Punjab's VAT laws included several penalty clauses which needed to be eliminated. 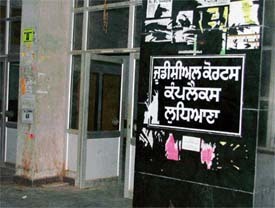 The Directorate of Research and Medical Education, Punjab, and the Punjab Nursing Council have taken a serious note of “inhuman conditions” in the Bengali Institute of Medical Sciences here and the alleged exploitation of students at the hands of the management. The Postgraduate Department of Commerce of Guru Nanak National College, Doraha, organised a one-day educational trip to the Ludhiana Stock Exchange today. The students were given information about online trading in the stock market. Fortyfive students from the local centre of Aakash Institute were admitted to MBBS and BDS courses in different medical colleges in the country during the current academic session. The executive council of the PAU Employees Union in a meeting held here today in the union office, decided to organise a protest rally because of the indifferent attitude of the management regarding their demands. Taking a strong note of a report published in these columns about the defacement of the Judicial Complex by pasting election-related posters, the in charge Sessions Judge, Mr D.R. Arora, issued directions to the president of the District Bar Association (DBA) to remove these forthwith. The Khanna Bar Association has split over the issue of rejection of nomination papers of three candidates for the post of president. The elections of the association are scheduled for December 20. On December 14 the papers of three candidates for the president's post were rejected after scrutiny. Many members of the bar had raised an objection to this. 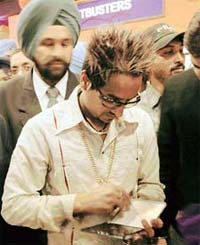 Funky looking Jaswinder Bains aka Jazzy B, justifies modernity in Punjabi videos, terming it as an essential ingredient that helps these videos reach out to youngsters, particularly in the West. “To reach out to this section, it is important that we include a part of their culture as well,” said the renowned Punjabi singer who was here to inaugurate a Music World outlet today. All decked up in gold ornaments, Jazzy, who is noticed more for his style statement — the spiky hairdo and heavy gold rings, chain et al — was quite vocal expressing helplessness of singers when it came to decisions regarding music videos.